This Midwest native shot to fame on the TV series Dawson’s Creek in 1998. Katie Holmes also appeared in the movie “Disturbing Behavior” for which she won Best Breakthrough Female Performance in the 1999 MTV Movie Awards. The following year, she starred next to Michael Douglas in Wonder Boys. However, it’s her love life that has everyone fascinated. Katie admitted that she had a girlhood crush on Tom Cruise and once said in a magazine interview, “I think every little girl dreams of her wedding. I used to think I was going to marry Tom Cruise”. And her prediction came true when Tom proposed to her at the Eiffel Tower. Katie was 27 when she gave birth to her 1st child and only child, Suri who is now 11 years old. 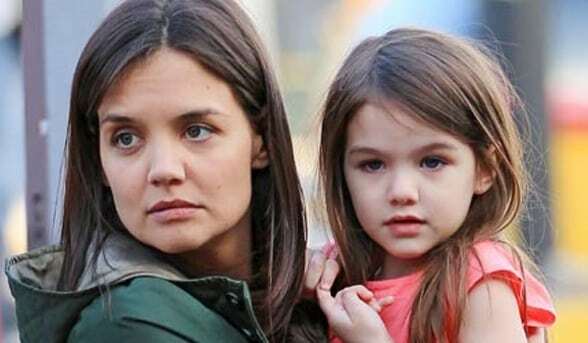 Unfortunately, the marriage didn’t last but Katie enjoys being a single parent and watching Suri grow into a beautiful young adult.